For the past 6 months, I've been working on a series of courses designed to help you build speed for blues guitar. This has been a challenging process because helping people build speed is a very different problem than showing them how to play something. I resisted the urge to put out a short course that would only benefit people above a certain skill level. Instead, I spent a lot of time thinking about how I built speed in my own playing, retracing my steps as a beginner 20+ years ago. This work made the entire process slower, but it paid off in a big way. 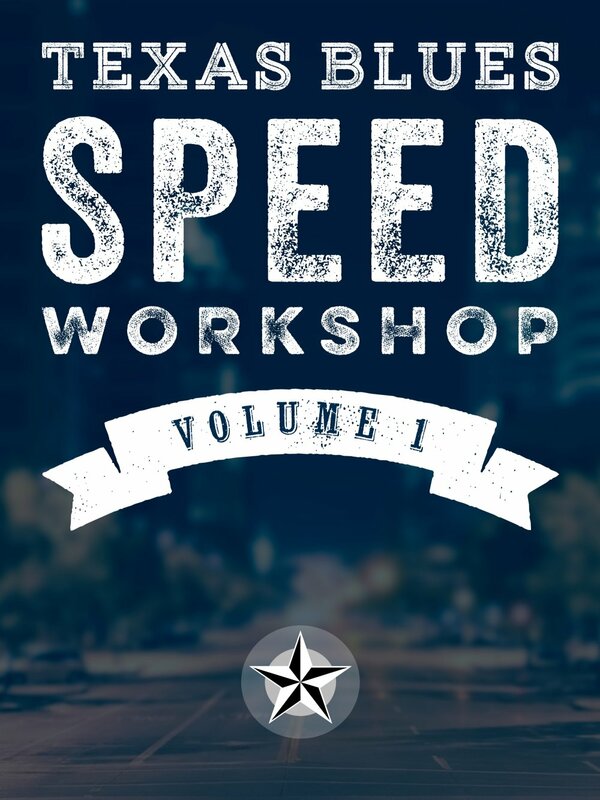 Texas Blues Speed Workshop will be a big departure from my other courses. For almost 10 years, most of my courses have been focused on teaching "what" to learn. Solos, licks, rhythms... I have tons of courses that show you how to play stuff. This approach works great for people above a certain skill level, people who are able to teach themselves. But it's not great for people with really limited time, or those who require more direct instruction about what to practice each day. As you'll hear in this video, I'm using a much different approach in these new courses. You'll never have to wonder what you're supposed to be working on, you'll never have to wonder if you're making progress, and you'll know exactly when you're done. The first two volumes will be most useful to true beginners, through early-intermediate players. I can't emphasize enough how basic the very first level starts off. As strange as it sounds, it will allow even a beginner to begin working on their speed in a structured, organized way. I'm also creating a "Fast Track" series of milestones and demonstrations for players who are way beyond the beginner level. The main teaching will still be done at a very basic level, but players with more skill will be able to apply that teaching (and measure their progress) in a way that is much more challenging. More information to come as the courses are finished, but here's the video with everything you need to know.